Walkley Feral Writers are a group of writers who meet together every week for inspiration, energy, fun, writing exercises, coffee and biscuits! You can find out more about the group and their creative work at http://walkley-feral-writers.blogspot.co.uk. Members of the group are also contributing work to Walkley History. 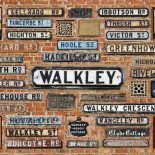 These are fictional and creative responses to the history of Walkley and some of the material we have gathered. We will publish their work here as it is finished. Ken Etchells – Stars of the Great War.